No matter what event you are planning in Tulsa, finding a functional and interesting location can not only ensure your event goes off without a hitch but create a memorable experience for all in attendance. Over the years, STOKELY has provided venue services for the Tulsa area for a wide variety of event types. Here is what makes STOKELY the most unique venue in Tulsa. Stokely Event Center has over 300 nostalgic Tulsa signs, vintage Route 66 memorabilia, old oil and gas signs and old advertising prints decorating the venue. This unique décor can help create the perfect environment for your party or event, no matter what it is for. 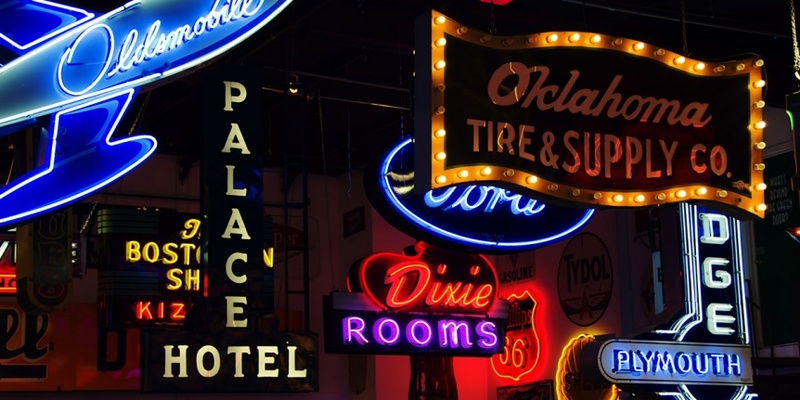 Attendees of all ages will love the neon and vintage signs that have created a memorable experience for so many. Classic arcade games provide a timeless experience for all ages. Whether you are mesmerized by a run on a pinball table or love the fun of play Skee-Ball, you will love the hours of entertainment provided by the free-play games at STOKELY. No matter what your guests enjoy, Stokely Event Center is sure to have it. Partnering with many venues often automatically means that you will have to work with a catering company to supply your attendees with food or beverages. STOKELY is Tulsa most unique venue because we allow you to have total freedom over the menu for your event or party. We often have events where the family pit master brings his portable smoker and smokes food for the whole family. If you can dream it, at Stokely Event Center it can become a reality! The Stokely Event Center has been providing the most unique venue in Tulsa for nearly 8 years. During that time period, we have held a variety of events and are ready to help make your corporate event a success. With our recognized unique settings and a wide variety of free entertainment options within the venue, we have solidified our place as a premier venue in Tulsa. If you are interested in booking the Stokely Event Center for your next corporate event, please call us at 918-600-4448 or submit a reservation request through our online form. We look forward to celebrating with you!